PDVSA is in a financial pickle, so lately they have been asking for loans all around the globe. From Russian and European oil companies to Halliburton (yes, that Halliburton), they have extended their hats in the hope of benefitting from the kindness of strangers, not only to keep paying their own bills but also the ones of the Venezuelan State. But as the oil company has become more entangled with all aspects of our economy, one important spending item for them is yet to feel a neccesary squeeze: their many sport sponsorship deals. PDVSA has become the most important advertiser in Venezuelan sports in recent years, from supporting school sports games to sponsoring many of our local football clubs. They also had signed deals with foreign clubs like Ecuador’s Emelec and El Salvador’s FAS (through its subsidiary ALBA Petroleos) which have been already been dropped. So, silver lining, at least the company has made some cuts. Yet no other deal has captivated the public’s attention quite as much as the one involving Formula 1 driver Pastor Maldonado. That has not stopped PDVSA from looking for the next major athlete to back, and apparently they just did: In the recently finished Roland Garros tournament, a young Spanish-Venezuelan tennis player named Garbiñe Muguruza pulled off a major upset by eliminating Serena Williams and giving one hell of a match to Maria Sharapova in the quarterfinals (the Russian eventually won both the match and the tournament). But even if Muguruza is currently representing Spain, that could change pretty soon. According to Spanish sport newspaper AS, PDVSA could be instrumental in convincing Muguruza to switch countries and start representing Venezuela after the request from the national tennis federation (FVT). Muguruza is expected to make her choice in October or November. 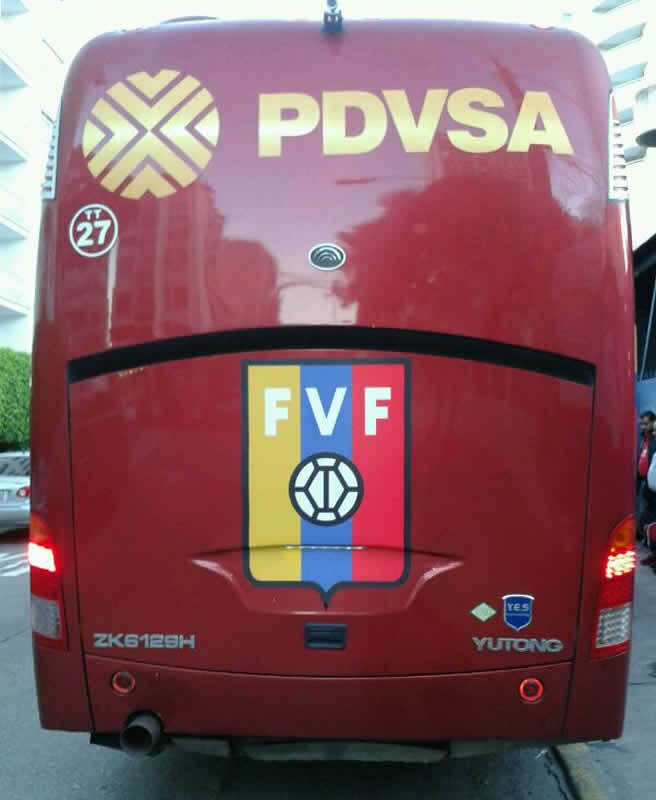 The other important sponsorship for PDVSA is the one tying them to La Vinotinto, the national football team. However, the Venezuelan Football Federation (FVF) surprisingly announced to the public that its former main sponsor, Empresas Polar, would return, but only in the youth-related categories. PDVSA will remain involved wiht the main team. Given the history of how the FVF and Polar broke off in the first place, this could signal that PDVSA is not fulfilling its role in the way the private company used to. Ultimately, one has to wonder where the value is for PDVSA in all of this. An oil company doesn’t need to sponsor athletes as advertisement – the stuff practically sells itself, so why go through all the trouble of having advertising in the first place. In fact, very few oil companies sponsor sports teams. It’s just weird. But PDVSA is not really an oil company. It is the financial arm of the PSUV, and as such, its ads are really attempts to link the governing party to national sporting icons. By tying their image to La Vinotinto or Maldonado or Muguruza, PDVSA seems to be telegraphing that even Venezuelans who don’t care for politics and only want to enjoy sports … can’t escape the gaze of the Revolution.